Get ready to blow the roof off and fill the dance floor with 100 club-banging patches for DUNE 2! Electronisounds presents “Renegade EDM”. Dune 2 is an amazing synth and these distinct sounds will help you take your tracks into deep melodic bliss! These are without question some of the best sounding patches we’ve ever programmed for ANY synth! We’ve got all your EDM needs covered with deep gritty-grimey basses, crushed & modulated dubstep basses, hard-knocking house basses, epic leads, perfect punchy plucks, smooth pads, dreamy reverb-soaked arps, modulated sequences and so much more! 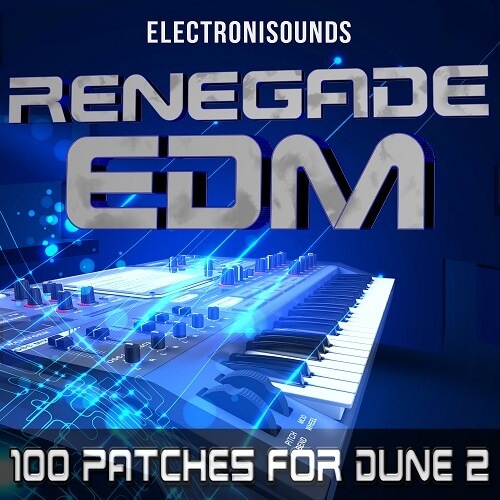 These patches are perfect for all genres of EDM such as: House, Electro, Dubstep, Trance & Psy-Trance, Techno, Hard Dance, Underground, Drum and Bass, Breaks, Chillout, Hip-Hop, Glitch-hop, Complextro & more. Extensive mod wheel programming is featured in most patches for extreme sonic flexibility and sound variation(s). Expand your sonic arsenal and get these incredible new sounds for your DUNE 2 VST synth! PLEASE NOTE: DUNE 2 is required.